Whether you love it or hate it, one thing is clear: technology is here to stay. Especially when it comes to your small business. Computers, networking, video surveillance (security cameras), telephones, point of sale terminals … Technology is integrated into almost every aspect of running your business. Sometimes it can be hard to tell what is a necessity versus a luxury, and whether or not something is worth the price tag. One piece of technology that every small business should consider investing in is a video surveillance/security camera system. Inventory shrinkage costs US retailers $46.8 billion dollars annually. As a small business, even small hits to your inventory can hurt your bottom line. Inventory shrinkage comes from two main categories: employee theft and shoplifting. 75% of employees will steal from their employers at least one time, while 37.5% will keep on stealing. On the other hand, it is estimated that 1 in 11 people will shoplift at some point in their lives, while only a fraction of those people will be caught. A well placed camera or two may be enough to deter these individuals, and if necessary, will provide evidence to be able to prosecute someone caught stealing from your business. Employees in small businesses often become like family. And, like family, you want to keep them safe. Security cameras can help. If your business employs the use of a production line or machinery, security cameras can help you monitor, in real time, what is happening. You can be on the lookout for unsafe behavior or faulty machinery. Another unfortunate reality small business owners need to be aware of is violence in the workplace. Each year, approximately 2 million American workers become victims of workplace violence. In fact, in 2017 424 violent deaths occurred in retail locations. By utilizing security cameras and video surveillance systems you can monitor what is going on in your place of business, as well as provide evidence to the police if necessary. Video surveillance and security cameras can help your small business save money beyond theft reduction. 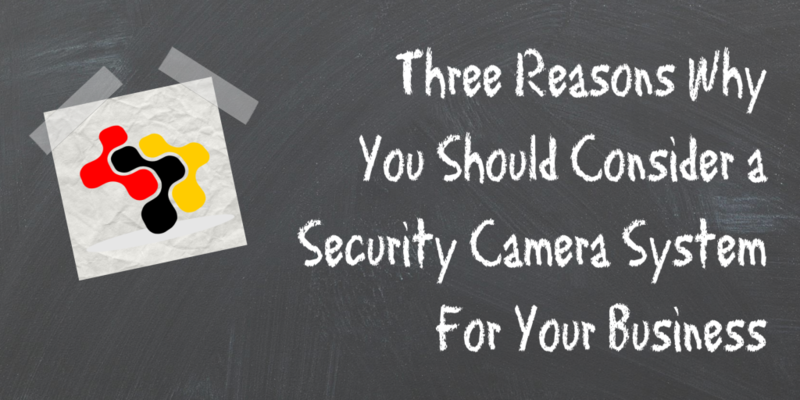 You can use security cameras to help improve employee productivity. It is a good way to see how efficiently employees are working. It’s also a great way to monitor what is happening on a production line and give you the ability to analyze current methods to see if there’s a way that will work better. You can also compare video footage of different methods to make better comparisons. You can also use video surveillance to help create a better customer experience. You can see what areas of the store your customers spend the most time in, you can see how they interact with your employees, if you staff enough employees in each section to meet customer need, among many other variables. You can use these analytics to tailor the customer experience, and a happy customer equals a customer who spends more money! Any type of video surveillance or security camera system is going to be an investment. But, it’s an investment that is worth it for a small business owner. It allows you to keep your business and employees safe, while also creating a better environment for your customer. It is a win-win situation. If you’re interested in getting more information about a security camera system for your business, please use our contact page, or call us at 443-201-8074. We would love to set up a completely free site survey of your business and come up with a plan that is just right for you.